The Japanese tea ceremony is a tradition centred on spirituality and servitude. Preparing and presenting a beautiful matcha (tea) for your guest is the ultimate expression of culture, ceremony, and respect. 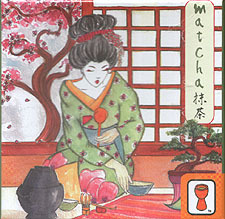 In the card game Matcha, players attempt to collect the utensils they need to perform a tea ceremony by matching cards on the table. Cards are played secretly, and sometimes it will be to your advantage not to match at all. With just a few cards and an assortment of tea utensil tokens, Matcha provides plenty of strategy for players who must decide when and where to play their cards to the table. A beautiful and fascinating bluffing game with just 18 cards. The game looks amazing, everything in here is top quality from the beautiful oriental artwork to the individual tokens, it looks and feels gorgeous. The game play itself is very simple, there are 6 cards laid out in three pairs, these are the cards that you will be trying to match up to in order to win a token of that type/suit. There are 5 different types; bowls, water drops, tea leaves, stirrers and whisks. Players win by winning one of each token, or 4 of a single type. Players will receive a deck of 5 cards and will select which one to place face down in an effort to 'win' the token displayed by the face up card. Each round has 2 cards, one will be won depending who plays the correct NUMBER (1-4) and the other will be won by playing the correct SUIT (as detailed above). Ties are broken depending on the rank of the suit played and number played. Play continues (a shuffle and another set of rounds may be required) until a player wins! The gameplay is simple, and there is just enough information on display (you can see 11 of the 18 cards) to give you much turn angst and deciding which of your cards is best to play. I really like this game and it makes for a great couples game, due to its non-combative nature and beautiful presentation - very mellow!